Stephen Grant opened with a level par 72 on the Asia Course to lead the Irish contingent at the First Stage of the Alps Tour Qualifying School at La Cala. The former professional footballer, 40, has no status on any tour and opted to give himself some options on the third tier circuit in 2018. "I have only played five rounds in three months and am thinking of playing with a half-set, my game left me about a year ago, and I may be better with half-set as I am forced two play with feel not technique which has ruined my game," he told his Twitter followers last week. The Birr man must finish inside the top 43 after today's second round on the Asia Course to qualify for the Final Stage, which begins at La Cala on Wednesday. 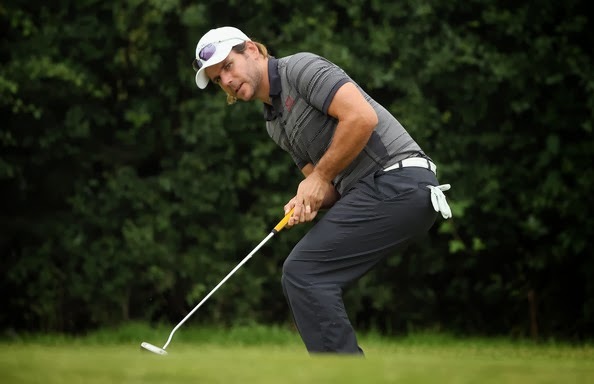 And he's well placed after round one, tied for fifth, five strokes behind South African Albert Venter, who shot a 67 to lead by a shot from Switzerland's Alex Messiqua. Justin Brink is tied 18th after a 75, but Michael Dallat is five shots outside the top 43 on 11 over after an 83 with amateur Ruairi O'Connor tied 73rd after an 85. There are 38 qualifying spots on offer at La Cala's America Course where Sean Denny is tied for 30th after a five-over 76. The 54-hole Final Stage will be played on Asia and America courses from December 14-16 with the top 35 awarded a full Alps Tour card. Castleknock's David Carey, Spain-based Simon Bryan and Naas' Conor O'Rourke are exempt into the Final Stage where the leading 65 players after 36 holes will qualify for the final round on the Asia Course. Players making the cut of the Final Qualifying Stage and finishing between the 36th and the 65th position will be eligible for membership in Category 8 of the Alps Tour for the 2018 season. Players between the 66th and the 144th position will be eligible for membership in Category 9 of the Alps Tour for the 2018 season. Players in categories 8 and 9 will be subject to the 2018 re-rank policy adopted by the Alps Tour Committee.